This article is about Caledonia as the Latin name for Scotland. For other uses, see Caledonia (disambiguation). Caledonia (/ˌkælɪˈdoʊniə/) is the Latin name given by the Romans to the land north of their province of Britannia, beyond the frontier of their empire, roughly corresponding to modern-day Scotland. The etymology of the name is probably from a P-Celtic source. Its modern usage is as a romantic or poetic name for Scotland as a whole. The original use of the name, by Tacitus, Ptolemy, Lucan and Pliny the Elder, referred to the area later known as Pictavia or Pictland, mostly in what is now Scotland, to the north of Hadrian's Wall (though the wall is all in today's Northern England). The name may be related to that of a large central Pictish tribe, the Caledonii, one amongst several in the area and perhaps the dominant tribe, which would explain the binomial Caledonia/Caledonii. The name of the Caledonians may be found in toponymy, such as Dùn Chailleann, the Scottish Gaelic word for the town of Dunkeld meaning "fort of the Caledonii", and possibly in that of the mountain Sìdh Chailleann, the "fairy hill of the Caledonians". According to Historia Brittonum the site of the seventh battle of the mythical Arthur was a forest in what is now Scotland, called Coit Celidon in early Welsh. According to Zimmer (2006), Caledonia is derived from the tribal name Caledones (or Calīdones), which he etymologises as "'possessing hard feet', alluding to standfastness or endurance", from the Proto-Celtic roots *kal- "hard" and *φēdo- "foot". Similarly, Moffat (2005) suggests the name is related to the Welsh word caled, "hard", which could refer to the rocky land or the hardiness of the people. Keay and Keay (1994) state that the word is "apparently pre-Celtic". The exact location of what the Romans called Caledonia in the early stages of Britannia is uncertain, and the boundaries are unlikely to have been fixed until the building of Hadrian's Wall. From then onwards, Caledonia stood to the north of the wall, and to the south was the Roman province of Britannia (consisting of most of what is now England and Wales). [note 1] During the brief Roman military incursions into central and northern Scotland,[note 2] the Scottish Lowlands were indeed absorbed into the province of Britannia, and the name was also used by the Romans, prior to their conquest of the southern and central parts of the island, to refer to the whole island of Great Britain. Map of the populations in northern Britain, based on the testimony of Ptolemy. Once the Romans had built a second wall further to the north (the Antonine Wall) and their garrisons advanced north likewise, the developing Roman-Britons south of the wall had trade relations with the Picts north of the wall, as testified by archaeological evidence, much of it available at the National Museum of Scotland in Edinburgh. The modern use of "Caledonia" in English and Scots is either as a historical description of northern Britain during the Roman era or as a romantic or poetic name for Scotland as a whole. The name has been widely used by organisations and commercial entities. Notable examples include Glasgow Caledonian University, ferry operator Caledonian MacBrayne, and the now-defunct British Caledonian airline and Caledonian Railway. The Caledonian Sleeper is an overnight train service from London to Scottish destinations. The Inverness Caledonian Thistle F.C. is a professional football club. In music, "Caledonia" is a popular folk ballad written by Dougie MacLean in 1977 and published in 1979 on an album of the same name; it has since been covered by various other artists, most notably Frankie Miller. The web series Caledonia and associated novel is a supernatural police drama that takes place in Glasgow, Scotland. Some scholars point out that the name "Scotland" is ultimately derived from Scotia, a Latin term first used for Ireland (also called Hibernia by the Romans) and later for Scotland, the Scoti peoples having originated in Ireland and resettled in Scotland. [note 4] Another, post-conquest, Roman name for the island of Great Britain was Albion, which is cognate with the Scottish Gaelic name for Scotland: Alba. ^ Haverfield (1911, p. 987) in Encyclopædia Britannica, though, states that "a tribe of Caledones" are "named by the geographer Ptolemy as living within boundaries which are now unascertainable". ^ Hanson (2003, p. 198) states that the military presence of Rome lasted for little more than 40 years for most of Scotland and only as much as 80 years in total anywhere. At no time was even half of Scotland's land mass under Roman control. ^ The extent of the reduction is a matter of debate. This association with a Silva (literally the flora) reinforces the idea that Caledonia was a forest or forested area named after the Caledonii, or that the people were named after the woods in which they dwelt. ^ Moffat 2005, pp. 21-22. ^ Bennet 1985, p. 26. ^ Watson 2004, p. 21. ^ Lacy, Ashe & Mancoff 1997, p. 298. ^ a b Koch 2006, p. 332. ^ Zimmer 2006, pp. 163–167. ^ Moffat 2005, p. 22. ^ a b Keay & Keay 1994, p. 123. ^ "Rock and roll years: the 1970s". The Scotsman. 16 October 2003. Archived from the original on 28 December 2003. Retrieved 17 January 2009. ^ "Biography". Dougiemaclean.com. Retrieved 17 January 2009. ^ Beacom, Brian (14 January 2014). "New detective drama set to hit our screens". Evening Times. Retrieved 26 December 2014. ^ Marshall, Andrew (26 August 2014). "Caledonia". Starburst. Retrieved 26 December 2014. ^ Smout, MacDonald & Watson 2007, pp. 20-25. Bede, the Venerable Saint (1999) . McClure, Judith; Collins, Roger (eds.). The Ecclesiastical History of the English People; The Greater Chronicle; Bede's Letter to Egbert. World's Classics. Oxford University Press. ISBN 0-19-283866-0. Bennet, Donald J., ed. (1985). 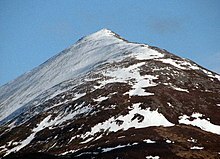 The Munros. Glasgow: Scottish Mountaineering Trust. ISBN 0-907521-13-4. Hanson, William S. (2003). "The Roman Presence: Brief Interludes". In Edwards, Kevin J.; Ralston, Ian B. M. (eds.). Scotland After the Ice Age: Environment, Archaeology and History, 8000 BC — AD 1000. Edinburgh University Press. ISBN 0-7486-1736-1. Haverfield, Francis (1911). "Caledonia" . In Chisholm, Hugh (ed.). Encyclopædia Britannica. 4 (11th ed.). Cambridge University Press. p. 987. Keay, John; Keay, Julia (1994). Collins Encyclopaedia of Scotland. London: HarperCollins. ISBN 0-00-255082-2. Koch, John T. (2006). Celtic Culture: A Historical Encyclopedia. 1. ABC-CLIO. ISBN 1-85109-440-7. Lacy, Norris J.; Ashe, Geoffrey; Mancoff, Debra N. (1997). The Arthurian Handbook (2nd ed.). Garland. ISBN 0-8153-2082-5. Moffat, Alistair (2005). Before Scotland: The Story of Scotland Before History. London: Thames & Hudson. ISBN 0-500-05133-X. Smout, T. C.; MacDonald, Alan R.; Watson, Fiona (2007). A History of the Native Woodlands of Scotland, 1500 — 1920. Edinburgh University Press. ISBN 978-0-7486-3294-7. Watson, William J. (2004) . The Celtic Placenames of Scotland. Edinburgh: Birlinn. ISBN 1-84158-323-5.
Zimmer, Stefan (2006) . "Some Names and Epithets in Culhwch ac Olwen". Studi Celtici. 3: 163–179.